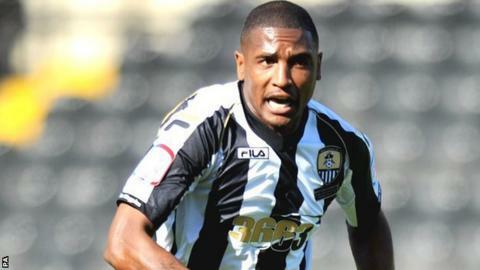 Notts County midfielder Andre Boucaud is desperate to make his Meadow Lane move from Luton Town permanent. Boucaud, 27, is on loan from the Blue Square Bet Premier side until January and told BBC Radio Nottingham he is relishing playing in League One and never wants to return to the Hatters. "I've proved I can play at this level and I want to stay," Boucaud said. "The new gaffer Paul Buckle came in at Luton and didn't fancy me. He didn't give me a chance." The former Peterborough, Aldershot, Kettering, Wycombe and York player joined the Hatters in January but has only made four league starts. He moved to the Magpies on loan in August and made an impressive start, playing in the first five games and earning widespread praise as he helped his new club surge towards the top of the table. His progress has been interrupted by a red card in the draw with Oldham - a decision which left boss Keith Curle stunned. But that dismissal aside, the Trinidad & Tobago international said he is relishing life in League One and said it is a far cry from some dark times with the Hatters. "I wasn't in the team, I was training with the youth team, they were going on tours and not taking me," he said. "It was terrible for me and what I saw, the only way for me was down." And although no talks have taken place yet about extending the deal with Notts, Boucaud hopes something can be sorted out. "I came here on trial and the gaffer gave me an opportunity in the first game against Hartlepool and I thought I took my chance," he said. "That's all I am trying to do, work hard and stay in this team and hopefully prove to everyone I can play in this league because I know I can. "I have always known I could play at a higher level, but it's getting the opportunity and there are a lot of players in the lower leagues who don't get the opportunity and fall by the side. "But if you don't get an opportunity you wont be able to play at this level. "I'm glad to be here and I don't ever want to go back to non-league football again."